So I was doing a pantry clean-out recently, when – to my horror – I discovered SEVERAL unopened bags of fancy flours. I’m talking coconut, almond, garbanzo bean – you know the kind. And I know exactly how it happened, too. When creating content for clients or other publications, I sometimes have to purchase an ingredient that I’ve never used. As such, I panic that I’ll have to make multiple attempts at getting a new recipe “just right”, so I buy an extra bag or two to play it safe. I figure, I’ll for sure find SOME use for it at some point. And then said bag goes to the very back of the very top shelf of my pantry – never to be seen or heard from again. For the next few weeks I’ll be sharing recipes that use these “alternative” flours in a variety of sweet and savory recipes. The timing is perfect with Passover around the corner, but as many of us are reducing (or eliminating) wheat from our diets, I’m hoping that you’ll find a recipe or two that you might want to try even if you’re not celebrating the holiday! Let’s start with coconut flour, and a super easy recipe. 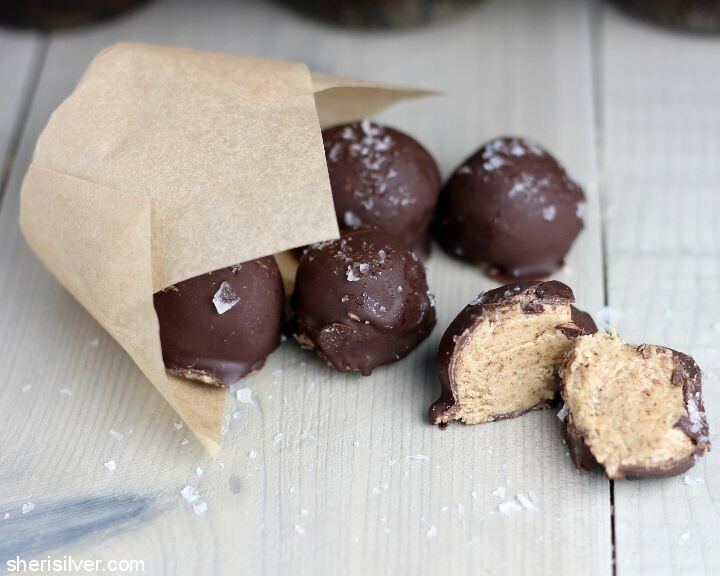 These little truffles contain just four ingredients and are gluten- and dairy-free. The fact that both Chelsea AND Noah can enjoy these means they will definitely be making an appearance at my Passover dessert table. And I was delighted to learn that in addition to being gluten-free, coconut flour is high in fiber too. And if you have a favorite recipe, feel free to share it here! I’ve created a “wheat-free” Pinterest board so we can all play along! Stir the almond butter and coconut flour in a medium bowl (note: if your almond butter is unsalted you may add a pinch of salt to the mixture). Freeze till firm enough to scoop. Scoop small mounds (about 2 teaspoons each) onto your prepared baking sheet. Use slightly damp hands to form the mixture into balls. Freeze till solid. Melt the chocolate chips in the top half of a double boiler set over a pan of barely simmering water. Remove one truffle from the freezer and place on a fork. Hold the fork over the bowl of chocolate and use a spoon to pour it over the truffle. Gently tap the handle of the fork on the edge of the bowl so that the excess drips off. Use another fork to slide the truffle back onto your baking sheet. Immediately sprinkle with a bit of flaky sea salt. 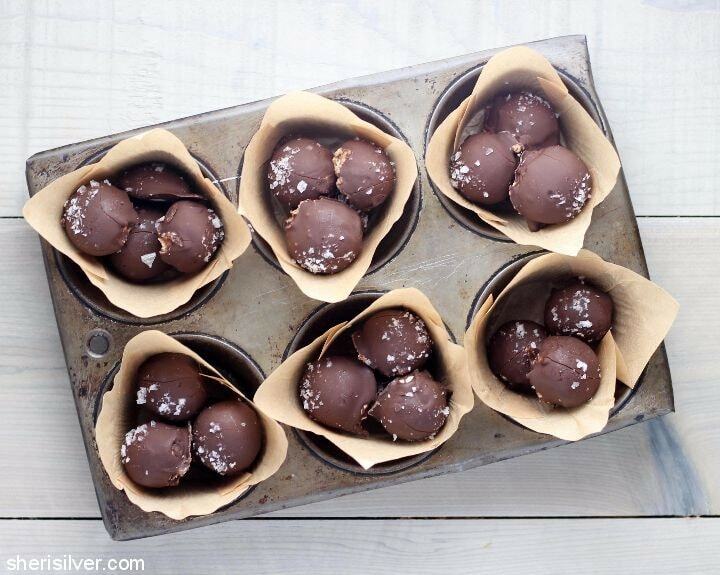 Keep truffles in the fridge till ready to serve. 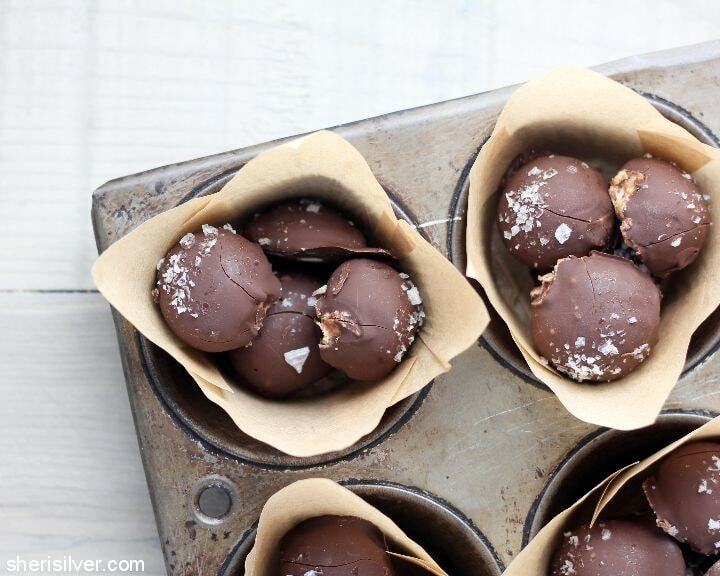 could definitely devour a few of these truffles right now! they look too incredible and so moorish. Thank you so much – and I know I’ve told you before but I am SUCH a fan of your beautiful blog! I’ve got to say I’m intrigued. And bravo for creating those somethings out of nothing. Curious about the calories of coconut flour too. Who needs stinky old wheat flour. So I was really excited to make these, but they didn’t turn out so well. The flour really zapped out all of the moisture of the almond butter and left it way too dry and crumbly, plus not sweet enough for a dessert like a truffle. I found myself adding coconut oil and honey and maple syrup to save my poor mixture. It turned out in the end, but I hope you make modifications for the future! Could crunchy peanut butter be substituted? I am excited to try some of your recipes, I will have to substitute due to being nut free. I can use sunflower butter, but would could I use instead of coconut flour? I found excellent non dairy, soy free, choc chips! You can swap the coconut flour for a regular all-purpose – I’ve also toyed with the idea of trying graham cracker crumbs too! You’ll just have to experiment a bit with the measurements. Let me know what you wind up with! Hi love this recipe just wondering if I can use almond flour? I would imagine you can – but coconut flour acts very differently so I’d start with 1/4 cup of almond flour and add more if needed. Please let me know if you try it and it works; I’ll add it to the recipe!